CEDAR CITY — Thanks to a stifling defense that kept their opponents scoreless for long stretches of the game, the Cedar High girls basketball team defeated North Sanpete 49-7 Thursday, the opening night of the Steve Hodson Cancer Classic. 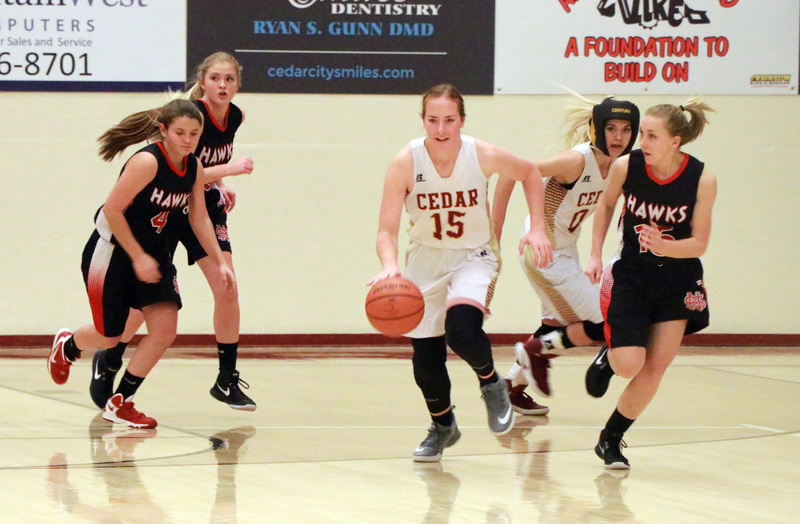 Cedar forward Dream Weaver, a senior in her first game back after suffering a concussion in a Dec. 19 victory at Desert Hills, was the first player to score in Thursday’s game, her 15-footer from the key putting the Lady Reds ahead 2-0. Midway through the first quarter, North Sanpete’s Tiffany Peckham stole the ball and drove down for an uncontested layup, cutting Cedar’s lead to 6-2 at that point. Incredibly, the Lady Hawks would not score again until Sarah Oldroyd hit a pair of free throws in the final minute of the third quarter to make it 43-4. During Cedar’s 37-0 run, North Sanpete missed numerous shots, including six free throws, and turned the ball over repeatedly. Cedar’s starters were all on the bench by the midway point of the third quarter, when they were ahead 43-2. The reserves outscored North Sanpete 6-5 the rest of the way. Freshman guard Logann Laws led the Lady Reds with 11 points, while sophomore forward Denim Henklel added 8 and senior forward Carley Davis contributed 7. A total of 10 different players scored for Cedar. North Sanpete was led by Kesley Eliason’s 3 points, while Oldroyd and Peckham each had 2. North Sanpete scored just two field goals during the game and was 3 for 12 from the free throw line. Grantsville defeated Snow Canyon, 46-41. Stansbury beat Canyon View, 51-32. Pine View outlasted Uintah, 52-43. For a recap of Region 9 boys teams at Thursday’s opening day of the Steve Hodson Cancer Classic, click here. In other recent action involving Region 9 girls teams, the Dixie High Lady Flyers lost their opening game Wednesday at the Gator Classic invitational tournament in Las Vegas, falling to Coronado High of Henderson, Nev., by a score of 49-38. Dixie junior Abi Finlinson led the Flyers with eight points. Thursday, Dixie faced Boulder City, Nev., and won by a score of 35-24, despite being held to two points in the fourth quarter. Sophomore Sina Schwalger led the Lady Flyers with 12 points, while junior Sina Tapasa added 9. Later on Thursday, Dixie defeated Yerington, Nev., 59-23 in their third and final pool game. The Lady Flyers will be in the Gold bracket as the tournament continues Friday and Saturday. In a different tournament in Las Vegas held last week, the Desert Hills girls went 0-4 at the Tarkanian Classic. On Thursday, Dec. 21, the Lady Thunder lost twice, falling to Carondelet of Concord, Calif., 68-38, and to Castle View High of Castle Rock, Colo., 50-40. The next day, Desert Hills lost to Bingham High of South Jordan, 55-33. In their final tournament game Saturday, Dec. 23, Desert Hills lost to Buckeye, Ariz., 50-43. The Lady Thunder’s next scheduled game is a Region 9 contest Jan. 4 at Snow Canyon.